The duplex, an apartment house with two units, became a popular housing choice in Milwaukee during the late-nineteenth-century period of rapid industrial growth and residential development. By 1911, a study of Milwaukee conducted by the United Kingdom Board of Trade, described it as the city’s most common house-type. 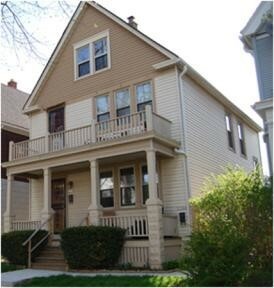 Although a few are found in wealthier neighborhoods, the duplex is primarily associated with the working-class neighborhoods built between 1890 and 1930, where it served the housing needs of Milwaukee’s skilled industrial workers and their families particularly well. Assisting in meeting the demand for a rental housing stock, this semi-detached house form also allowed home-owners to earn income from renters or accommodate extended families. 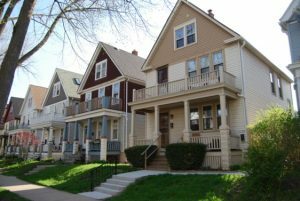 There are many duplex configurations nationally, but the most common form of duplex in Milwaukee is the up-and-down arrangement or two-story “two-flat.” Most floor plans use the popular “bungalow plan”—that is, with a rectangular shape placed perpendicular to the street, its public rooms (living room, dining room, kitchen) lined up along one side and private rooms (bedroom, bathroom, bedroom) along the other. This standard arrangement is completed with a wide porch in the front and enclosed staircase in the rear. Like the popular and contemporary single-family bungalow, it was equipped with new amenities for its working-class residents, including: kitchen facilities, dining room, three-fixture bath, private bedrooms, and closets. Given such features, it offered Milwaukeeans the comforts of a modern American house. ^ United Kingdom Board of Trade, Cost of Living in American Towns (London: His Majesty’s Stationery Office, 1911), 266. ^Thomas C. Hubka and Judith T. Kenny, “Examining the American Dream: Housing Standards and the Emergence of a National Housing Culture, 1900-1930,” Perspectives in Vernacular Architecture 13, no. 1 (2006): 59-61. ^ Hubka and Kenny, “Examining the American Dream”: 49-69. Hubka, Thomas C., and Judith T. Kenny. “Examining the American Dream: Housing Standards and the Emergence of a National Housing Culture: 1900-1930,.” Perspectives in Vernacular Architecture 13, no. 1 (2006): 49-69.